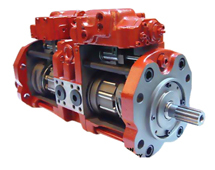 These motors are of axial piston, fixed or variable displacement, inline design. The units can be operated in either direction of rotation. Flow direction is as indicated. MFB motors are variable horsepower – horsepower being approximately proportional to rpm with a given constant operating pressure. Service may be continuous, intermittent, continuous reversing, or stalled without damage when properly protected by a relief valve. Output speeds are dependent on input flow. Speed ranges of at least 36:1 are possible at the maximum torque rating by varying flow to the motor. Vickers MFB Motor: Vickers fixed displacement inline piston motors offer a choice of five torque ratings, speed from 100 to 3600 r/min and pressures to 210 bar (3000 psi). 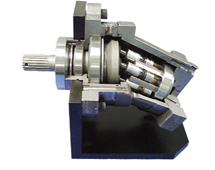 Reversible shaft rotation and flange or foot mountings are available. High Efficiency: Overall operating efficiency can be as high as 93% and volumetric efficiency as high as 97%, depending on motor size, pressure, speed, fluid viscosity, and temperature. Compact, High Performance High speeds, pressures and efficiencies give Vickers inline piston motors power density. The result is high performance in a compact package that requires minimum installation space. Rotation can be reversed simply by reversing the direction of flow through the motor ports. 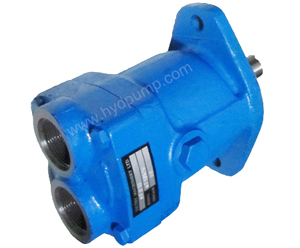 Minimum speed can vary between 50 and 100 r/min, depending upon motor size and characteristics of the drive load. Vickers inline design has seen countless hours of rugged service on a variety of machinery applications. This proven design has provided significant cost and weight savings, while taking full advantage of the high efficiency inherent in piston units. The simplicity of Vickers design not only permits easy servicing (often without removing the unit), and also increased reliability. Vickers inline motors have fewer parts compared to competitive units. Piston Motors MVB: Vickers variable displacement inline piston motors offer a variety of displacements, speeds, and pressures. 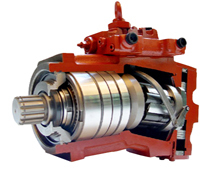 Rotation: Shaft rotation can be reversed simply by reversing the direction of flow through the motor ports. 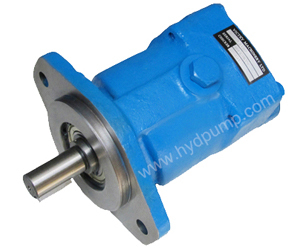 However, shaft rotation must not be reversed by reversing the motor’s displacement control, while the motor is running. Controls: A hand wheel or lever is used to select displacement. 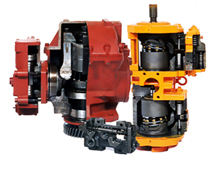 Both controls allow the motor to operate on either side of center, permitting bi-directional shaft rotation. The controls can be assembled on either side of the motor to facilitate motor installation and provide optimum control accessibility. Output speeds are dependent on input flow and the position of the displacement control. With constant placement to the MVB5 or MVB10 motor, a speed range of 4:1 is possible by varying displacement. Horizontal mounting is recommended to maintain the necessary case fluid level. The case drain line must be full size and unrestricted, and connected from the uppermost drain port directly to the reservoir in such a manner that the housing remains filled with fluid. The piping of the drain line must prevent siphoning. The drain line should be piped so that it terminates below the reservoir fluid level. No other lines are to be connected to the drain line. Caution must be exercised to never exceed 0,35 bar (5 psi) unit case pressure. Before starting, fill case with system fluid through the uppermost drain port. Housing must be kept full at all times to provide internal lubrication.